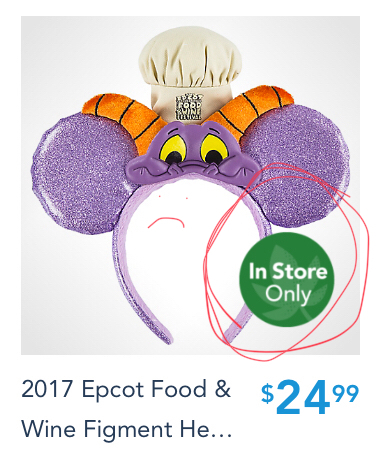 From the moment I laid eyes on it, I knew the limited edition Epcot Food & Wine Festival ears needed to be mine. Only one problem: I'm not going to the festival this year. No problem, though! Lately Disney's been putting 95% of parks merchandise on the Shop Disney Parks app. There isn't much that can't be had through the app, and the initial blog post revealing the merch promised most of it would be available. Of course there's always eBay and such, but pricing tends to be so inflated there. My best hope was probably going to be waiting until after the festival ended to see if any stray unpurchased leftovers made it to the app. Not an impossible dream but I didn't love the odds. I. AM. SO. HAPPY. I'm going to wear these with my 1998 Figment shirt like a complete dork. And then I'm going to ride the Figment ride and the Cast Members will ACKNOWLEDGE THE AWESOMENESS. They must! They shall! It's gonna be a good trip, guys. Oh yeah. I never look back, dahling; it distracts from the now.